Real Estate home inspections in Reno/Sparks, Truckee, Lake Tahoe and surrounding areas. George began his home inspection business in 1988 as a sideline to his remodeling construction business. Over the years it went from part time to full time in 2004, when he stopped doing construction work. George is an advocate for continuing education in the home inspection business due to ongoing changes in home construction. 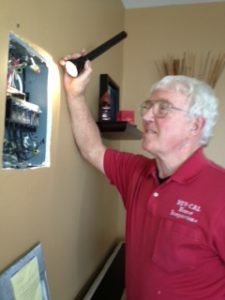 He has enjoyed being a mentor and educator for home inspectors. Home inspection is a business where you do the same thing every day, but it is always different, making it a rewarding occupation. George retired from field work in 2016 and In his free time, George enjoys bowling, reading and traveling. I have purchased 6 homes in my lifetime and at 60 years old I hope this is my last one. I was referred to Nev/Cal by my agent who has had great history with them. Randall and team were fantastic. Not only did they do an extremely thorough inspection, but then he walked us through the inspection in great detail. NEV-CAL Inspections, LLC 2016 | All Rights Reserved.